By Rebecca Bitzer, MS, RD, LD. How can Meal Prep Help? One of the most difficult parts of recovery from an eating disorder is consistently following a meal plan without doing meal prep. For people in recovery, I think of meal prep as anything that you can do to help you follow your meal plan (meal structure) so you can spend more time on living your life. You’ll have more energy for recovery. And devote less energy on food stress. Having the tools to stay calm in the grocery store and kitchen will help you be successful. Focusing on organizing your food in a step-wise fashion may even help you look forward to meal prep and possibly even enjoy cooking. Being vague with your eating plan is a slippery slope that may leave room for a slip in terms of your recovery. Being clear, intention and pro-active will help you be successful. Set yourself up for positive decisions that promote recovery by fine-tuning your meal prep skills. 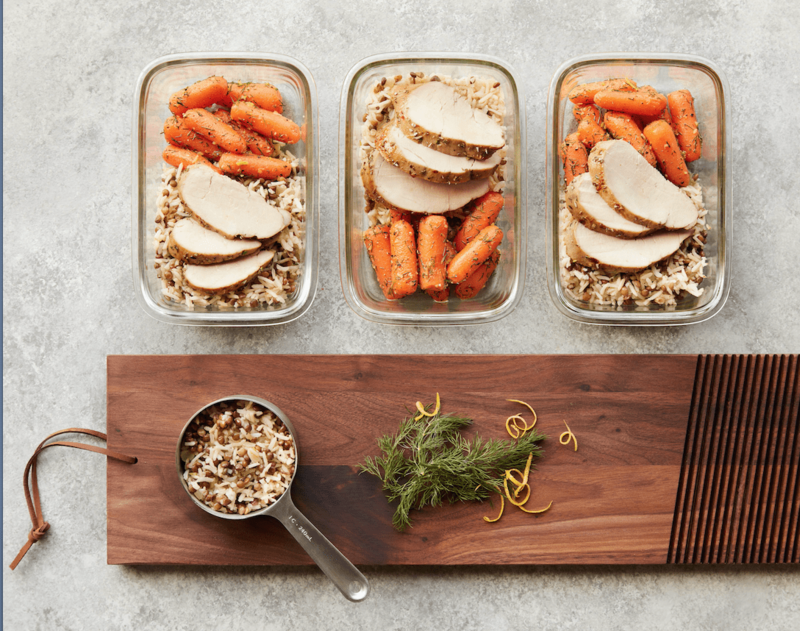 Whether you are confident in the kitchen or just starting out, setting yourself up for success includes meal prep. Remember, it is easy to get overwhelmed in the kitchen so here are some tips to help make meals easier. At this point, you have probably worked with a Registered Dietitian (RD) specializing in eating disorders. If you have not, it would be a good time to take the step to include a RD on your team. Be aware of red flags which may indicate a risk of lapsing back into eating disorder behaviors. Wow, that is a long list of food related behaviors to be aware of! So how can you follow your plan without being overwhelmed? 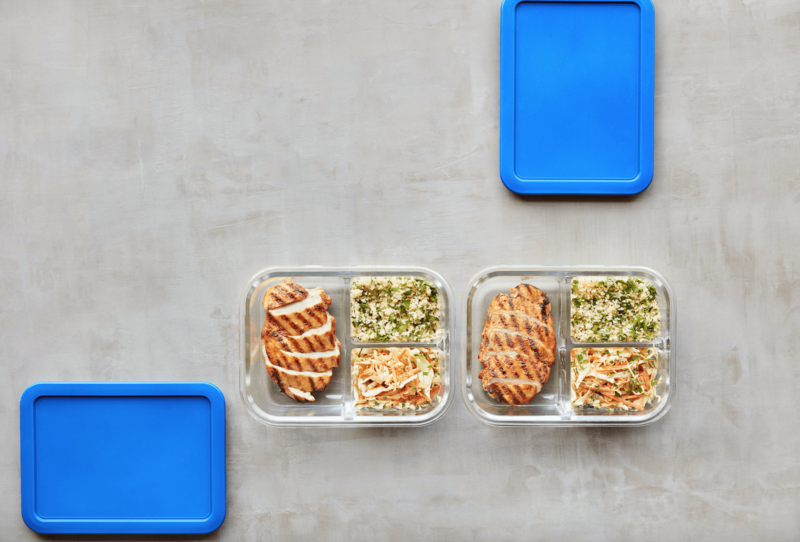 Here are some meal prep types to help you be clear about making your food a priority. The first step is to set up a meal plan of what you are going to eat. It is best to have an overall meal plan before you get into the nitty gritty details of how you are going to meal prep. Work with a Registered Dietitian to help you come up with an individualized, customized meal plan that is right for you. 2. Make sure that you have the tools you need to make meal prep easy. Look for COOKBOOKS, books on meal prep, pinterest and instagram for inspiration. Instead of getting overwhelmed with too many options. You might want to start more simply with one resource. Recently, I learned that an award-winning dietitian published a book on meal prep that could be extremely helpful to you. 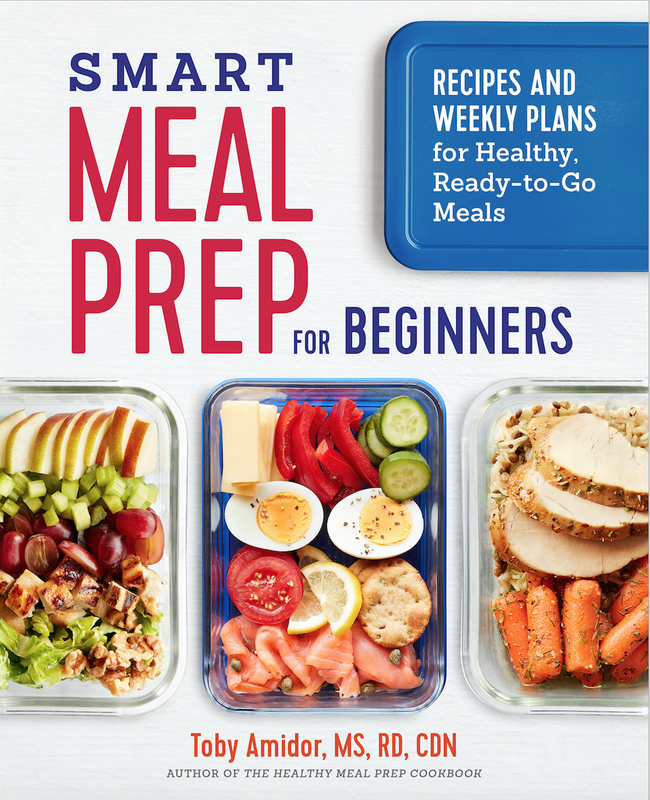 The rest of this blog is includes tips and hacks and recipes from dietitian Toby Amidor’s new book: Smart Meal Prep for Beginners: Recipes and Weekly Plans for Healthy, Ready to Go Meals. So, thanks Toby for your help! Choose one day that you are going to meal prep. Look for a day that you will not feel rushed. You want to plan on having the food available to cook and store food to be eaten later in the week. 4. Start with a recipe or two that you love. 5. Go to the grocery and purchase your food. This can be the same day that you plan to meal prep or a day or two before. Do what works best with your schedule and your personality. 6. Set your kitchen up to stay as calm and focused as you can. Again, starting off small is key. If you are not used to cooking, then try to prep only one or two meals. Overtime, you will build your confidence and be able to efficiently meal prep three or more meals in one day. Make sure to leave plenty of time to divide up your meals into containers as soon as you are finished cooking. This will help you grab and go with your food to save time later in the week. TRIGGER WARNING: This smart meal prep cookbook has tons of great tips and ideas so it is definitely a great tool. It does however, have a few comments here and there about calories. The recipes also have the calories listed. I recommend doing exactly what you have been instructed to do at a restaurant where calories are listed. Ignore this information, it is not helpful to you in terms of your recovery. This book has amazing tips and even six weeks of sample meal plans along with step by step instructions on how to easily prepare this foods. So, use this book with your wise mind and have fun in the kitchen. 7. Try some new recipes as you expand your meal prep and meal planning skills. Here are some recipes that look especially delicious to me. Remember to follow your specific meal plan. It is your meal plan that will help you in your recovery. 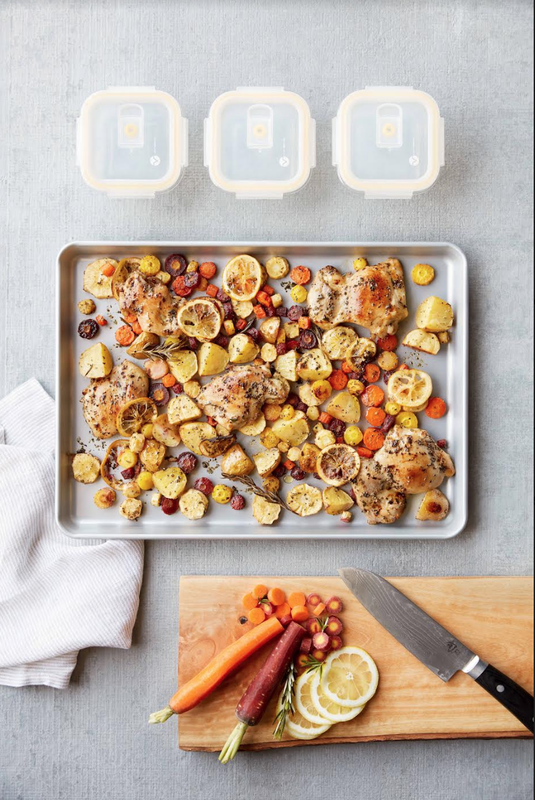 See the link below for Toby Amidor’s, Smart Meal Prep for Beginners Sheet Pan Lemon Chicken with Potatoes and Carrots recipes and a sneak preview of other recipes included in her book. More meal prep recipes from Toby’s New Book. In summary, following the meal plan you set up with your dietitian for eating disorder recovery is so important. Meal planning is a tool to make following your plan an easier, lower stress, experience. If you have any questions about meal planning email me at rebecca@empoweredeatingrd.com or call our office at (240) 670-4675 to talk with me or any of our other amazing dietitians. *Recipe credit: Copyright Toby Amidor, Smart Meal Prep for Beginners, Rockridge Press, 2018.